So I saw this idea spitballed a few times in a few different threads and there seems to be some genuine interest in making it happen. This would be a small, printed, hardcover book of some of the most gorgeous keyboard pictures you've ever seen. All pictures would be user submissions from the related keyboarding communities. This depends on the number of orders that we can get placed. Quantity will definitely make them cheaper. I'm thinking they should be around normal book prices $20-$25 usd, but I haven't gotten a quote yet. Shipping in the US will be UPS Ground daily rates, which are the cheapest UPS ground rates available. Unless we drop ship each copy from the printing company, then their shipping rates apply. International shipping hasn't really been figured out yet, but katushkin has offered to be the EU proxy and I think that will yield the best rates unless drop shipping will be cheaper. As of now, this is the interest thread. If you are interested in ordering a copy, post with how many you would like and your shipping state/locality/country with zip/pin codes. This way, we can figure out what the distribution logistics demands will be. Once the official group buy thread is up, I'll figure out how the ordering process will be. I think I'll just make it a paypal buy link like how I do for stickers for my forum, but I'm not 100% sure about that yet. I think the easiest way for payments to be handled is via paypal invoice. I have a paypal business account for my forum and I can use that to buy the books and then invoice out and get payments prior to shipping/drop shipping. This way, communications on individual orders will be easy since a paypal shipping update will automatically notify buyers. Don't know yet. The first part of the project is obtaining all the media from users that would like their photos included as well as executing the appropriate licenses to allow them to be published in the book. I think this phase will take the longest time. The next step will be laying out the design of the book itself. The third step will be getting payments/sending it off for printing, which I think will actually be the shortest step. And the final will be the distribution of the final product, which may be included in the previous step if they're drop-shipped. After uploading, you'll need to execute a license to grant permission for publishing. I'll put a link to the document here once I finish it. Here's what I need--correspondence help (no one likes a question to go unanswered), book layout and design, photo submissions, EU logistics, any other International logistics, and probably some help in the areas of my strength just to keep the workload manageable. Post it below and I'll answer the best I can! Revised size to not be small based on consensus in thread. Cool idea, but I agree with @katushkin, I think the book would have to be at least 10 inches wide. I like this, any thoughts on how many pages? I can help with book layout and design when the time comes. I've done a lot of that sort of thing. As far as the book itself, I'd agree that it needs to be biggish. Especially if it's photo heavy. I know on some sites like BLURB you can do 20 pages starting at 14.99 for a small book and the price goes up depending on size, hardcover or softcover, and amount of pages. **** slack. DM me here if you need me! It's gotta be like, a couple hundred maybe? I'm sure there are more than that many great boards around on all the forums. I would pick one up for sure. Have you tried connecting with those making the tactile zines? Definitely interested! I agree, large size and hard cover would be highly preferred. I don't have any professional experience but I'm fairly comfortable using InDesign and Photoshop and did two years of yearbook club at highschool if any help is needed producing pages. I may also be able to get some contacts for publishing. This would be a great way to quickly expose friends or family to the hobby. The only advice I may have would be to choose the photos wisely; curate. You don't want to overload it with content. Sections that document the assembly of a board (like Photek's 360c) might also be a nice inclusion. I was initially thinking something smaller as printing costs can go up with size, and I'd like to see more pages as opposed to a folio of just 10 pages, but I do like the idea of a glorious 10x10" picture book. This gives us an idea on the sizes and number of pages (slides as they call them) available. I've sent them a request for quantity pricing since their price breaks start at just 10 units and it waives a lot of the setup and other fees. Awesome! Asukabook seems to have their own software which is free to download among other design solutions. Check it out and start playing with it and let us know what you think. I have a Blurb book and while that's a very goto publisher for 'entry level' wedding books and such, the quality isn't so great. Since this will possibly be just a one-time run, I'm thinking these books need to be made to last. The largest number of 'slides' available on Asukabook is 50, which is 50 pages front and back or 100 pages. I was kinda leaning towards this number as well or the 30 slide version (60 pages), but cost may go up substantially for books of this size. We'll find out once I hear back from them about pricing. They're closed until Jan 3rd. I haven't yet. I want to see what Asukabook has to offer first before hitting traditional publishers. If we end up going the route of a traditional publisher, then that changes the printing stage completely and maybe even the design phase a bit depending on if they want to do the design work in-house. Very cool! Seems like the 10x10 size is what everyone is leaning towards. Once I have pricing from Asukabook, let's see what your contacts can do for comparison pricing. I know Asukabook is going to be a premium, but I'm not sure how much of a premium they are yet. Absolutely. And I think a crowdsourced content and curation process will be one of the longest phases of this project. Even potentially a few pages of other good or great boards that weren't as wow as the others, but still worth a look (like 6-9 pictures per page for 3 or so pages). Yep, except I think the problem we're going to have is getting to many awesome pictures of boards that it's going to be tough to decide what doesn't make the cut. At least that's my hope. I think that would definitely be a problem, there is definitely a lot of great boards on here. I really like this idea though, I'm hoping to contribute if my boards are deemed worthy. Please do! Attach them right into this thread and we'll all check them out! I think the biggest factor will be the quality of the photography more than just the uniqueness of the board itself, so I believe there's going to be enough variety for everyone. I was even thinking we should maybe contact manufacturers for some of their 'best' photos as well for inclusion. Thoughts? I was thinking about the workflow to get all the images in one place where we could decide on what makes the cut and what doesn't, and I think the easiest solution would be for each submitter to be able to upload their photos directly to a repository (which I already have). Then we as the community can look at the images and decide what makes the cut and what doesn't. Thoughts? I'll be travelling for work from Jan 5th-14th and usually don't have time to breathe during that time so if I disappear for a bit don't be alarmed. Where do I sign up? There better be a Vol 2. There should be a separate book for just artisans. I feel like there's a surplus of quality photos on here to be honest. As for the manufacturers I don't know if I would necessarily like that myself because I imagine this book to be filled with keyboards of variation and creativity rather than a manufacturers board with boring old keycaps and what not. Yeah if we could probably upload the images to a single source and have an easy voting system on it then I think that would be great. Here's my favorite shots of my one board, the TGR-Jane. I just took this recently and actually posted them in a couple threads including my build log. I could always break the board down as well and show the shots of the components and what not. These pics are coming from my Flickr, I can also unedit my watermark for the book as well. Sorry about the long post, I can always shorten it up if you'd like. Perhaps have a voting system for the photos to be put in there? Like have people submit them or suggest people's photos from any thread? How would they be picked? Sweet! Can't wait to see the submissions. Since I think the problem we'll be having is trying to pick which ones don't make the cut as opposed to those that do. And depending what is done for layout and design, we may not have to cut anything at all. Sweet shots! I love the color offset that helps the board pop. I'm thinking that maybe leaving watermarks might be the best way to help attribute credits. Or not. I'd like to hear thoughts on this. I've set up a submission link where originals can be uploaded and everyone can look at them. While the originals are uploaded, they are not accessible to discourage unauthorized use. Display sizes are limited in size. So now that this project seems to have some steam behind it, I think it's time to go big time with it. And I'm going to need some help with that. Firstly, I really want this to be a book for the whole keyboarding community--worldwide and Internet-wide. That means Deskthority, Reddit, and the various Asian forums too. I have an account for DT, so I can make a similar thread there as I have on here, but I need help getting the word out to the other communities. I need leaders to spearhead each of the other communities. Secondly, this book is going to be about content, and it won't just come to us. So I need the community to find the images they love, and point the owners of them to this project letting them know it would be awesome if they submitted the originals. That's it so far. I'm really excited with how this is going. It's a Monday so I've got my normal work in front of me as well as the work trip coming up, so don't worry if I'm a bit absent. Very cool idea. How do you plan to have section the book based on keysets, model of keyboard, layout? Alright well I uploaded the pics to the website, realized after the fact that you can't edit the names so it's just going to be the name my camera gave it when taking the shots. That's alright though since I uploaded the image with watermarks, I think it will actually be better to leave the watermarks to give credit than text on the book page. First off I just want to say that this is an AWESOME idea, and I would love to see it come to fruition (even though my photography skills are crap). I'm thinking that maybe leaving watermarks might be the best way to help attribute credits. Or not. I'd like to hear thoughts on this. I think each page should have it's own unmarked spread with a little column or tag somewhere that has a full description of what we're looking at - as well as the photographer's name (maybe location too!). I suppose it could simply be put under the picture as well, depending on how you wish to format the page. That way pictures are still accredited, we get the full picture in the book, and a little description of what we're seeing for those that aren't able to identify every component of every keyboard. Also, I know most people here won't need it - but I was just thinking about a glossary section! If it is indeed meant to be a coffee table book this could be pretty helpful for your guests that aren't as keyboard savvy as the rest of us. Dunno. That's a good question. What's your thoughts? I know the layout guys will probably have some really good ideas on how to organize everything. I like the idea of having more than just a credit/watermark with a small blurb of what we're looking at (full tech specs) as well as the owner/photographer and the geographic location. But this is more of a layout and design issue, which I'm sadly no expert at. As far as dividing it up, that's a good question. While guys who have done layout would know what feels best from that perspective, I'd like to also hear thoughts on what works for us from a reader perspective. The glossary is kinda a neat idea. But with all the terminologies we have, wouldn't it become a bit of hairball? I'm not sure what the end result will be for photos selected - but I imagine organizing the book by keyboard size/layout would probably be easiest. That way you get a nice balance of crazy customs in each section as well (as opposed to say, Korean Customs as a standalone section). Chronological order could be cool as well but something tells me this isn't a "history of keyboards" coffee table book, but rather a nice collection of eye candy. Yeah the glossary thing was just a random thought I pulled from a coffee table book I already own. We definitely do have a lot of obscure terminology....I doubt it would be very useful. I'd arrange them by the type of switch they are using: buckling spring, MXs, Alps, Topre, Hall effect… It would be nice to have a short introduction of each of these sections explaining the technology used. Inside these sections, you could arrange them by size/layout. 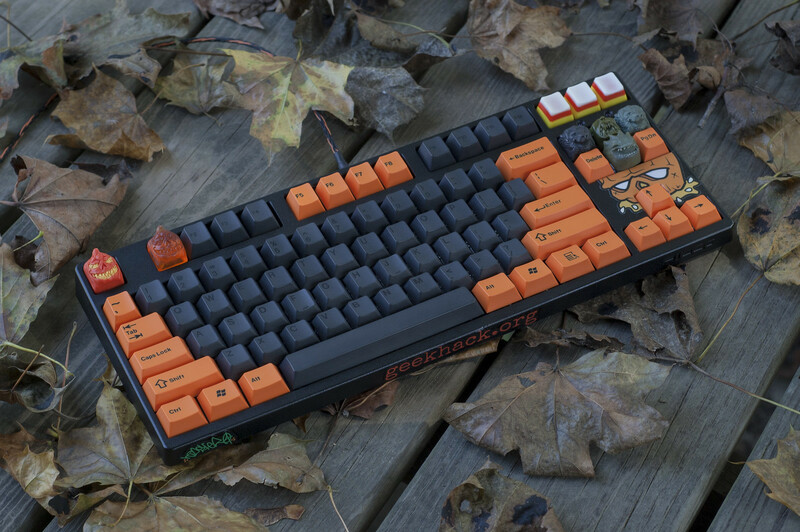 I personally believe that the pictures shouldn't have a watermark but a description of the picture itself with model, case, keycaps, artisans, and obviously the name of the owner of that board. I think 50mm are the best for these kind of shots. Same, I'd love to get in the book myself. I don't ever know if my pics are ever that good, I'll get a few compliments but not too many. I can't recommend www.acilab.com. My wife works there and has experience in the books department. They have recently been voted the number one photo lab in the country by the PPA (Professional Photographers Association). The owners there Mark and Lisa are amazing people. Feel free to pm my wife here for more info. She goes by Alexis's. Just make sure to include me in the pm as she doesn't check in here very often. It's more about the lighting than the lens. You can get some great bokeh even in macro mode on consumer cameras. I can recommend www.acilab.com. My wife works there and has experience in the books department. They have recently been voted the number one photo lab in the country by the PPA (Professional Photographers Association). The owners there Mark and Lisa are amazing people. I'm not sure if there's a 50mm 1.2 lens out there for the nex, but that would be my goto. 35mm can feel a bit cramped. People still use coffee tables? I'll get a few compliments but not too many. You will once GH snaps out of its artisan cap circle jerk phase. Yeah, that's a really nice lens, but a 1.2 would be even better if it exists.